Unlike the Watermelon Gazpacho, I did actually prepare this recipe. We had it last night for dinner and let me tell you, it was yummy. 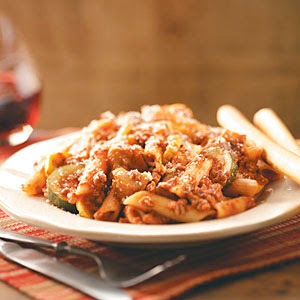 Now, it's obviously not a true bolognese, but it does have quite a bit of meat in it like a traditional bolognese. A couple of notes: I used only 1 teaspoon of sugar versus 1 tablespoon. I don't like my tomato based sauces too sweet. Also, instead of following the directions, I cut my zucchini and squash in chunks like the eggplant. This is because I tend to jump right in without reading recipes all the way through. But no matter, it turned out fine. And last, I don't own any Italian seasoning, so I just threw in some dried oregano and basil. The kids loved this and it's a great way to get some veggies in! Cook pasta according to package directions. In a large bowl, combine the eggplant, zucchini, squash, onion, oil, garlic, salt and pepper. Transfer to two 15-in. x 10-in. x 1-in. baking pans coated with cooking spray. Bake at 425° for 20-25 minutes or until tender. Meanwhile, in a large skillet, cook beef over medium heat until no longer pink; drain. Stir in the tomato puree, Italian seasoning and brown sugar. Drain pasta; stir in tomato mixture and roasted vegetables. Sprinkle with cheese.